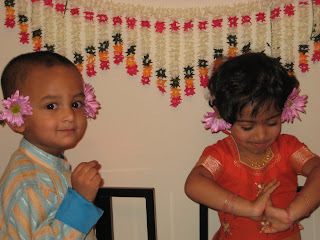 Some of our friends gottogether and celebrated this year's Pongal at our home. As actual Pongal (14th,15th) was on a weekday. 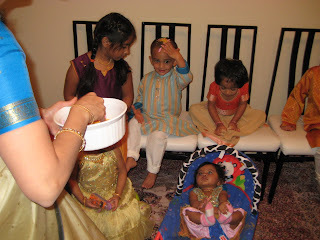 we did Bhogi pallu the previous weekend itself. 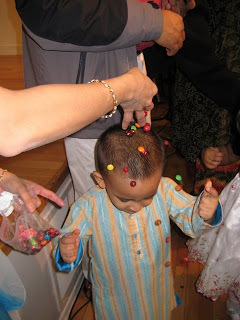 Last year Kedaar was much younger to enjoy this, but this time he had a lot of fun and thoroughly enjoyed the bhogi pallu program. We also attended the Sankranthi event conducted by WATS this year. 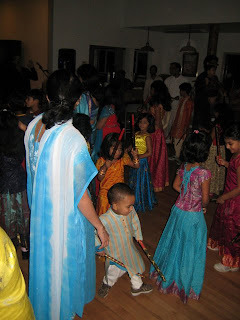 Along with some other cultural programs, they arranged for bhogi pallu & "Kolatam". 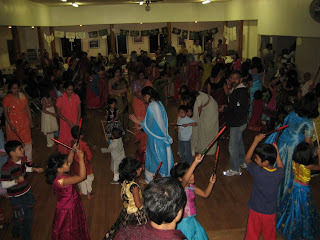 Interesting thing for us is that Kedaar danced for almost 11/2 hrs during Kolatam program with sticks. He was just trying to imitate what other elder kids were doing (dance with the rhythm and spin). He didnt even want to come home and cried a lot when we were returning from the event. Here are some pictures from these ocassions.